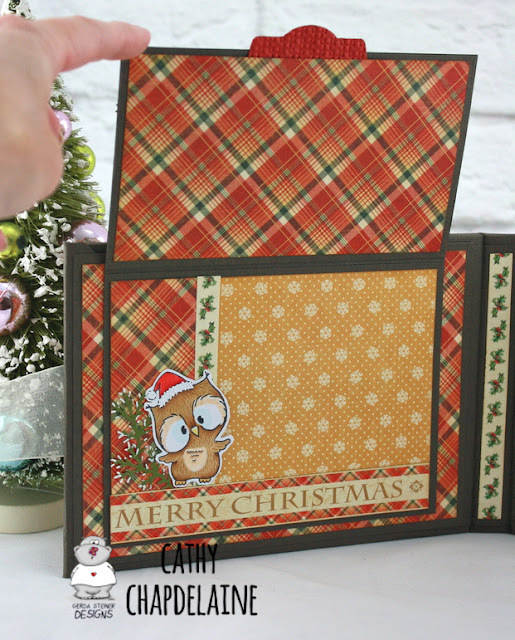 I've had a passion for making mini-albums for about 10 years now and when I saw this new stamp, I knew I wanted to make a little mini-folio for baby's 1st Christmas pics. This is a fairly simple 5x7 album and holds up to 6 photos. I constructed the covers from two 5" x 7" chipboard pieces and a 1/2" x 5" chipboard piece for the spine, all wrapped in cardstock. I added a fabric-like embossed specialty paper on the spine with a little pom-pom fringe for a softer effect for baby and there's an ivory ribbon closure to match. I chose the Graphic45 "Twelve Days of Christmas" papers for a traditional Christmas feel and based my Copic coloring of the baby stamp off of them. I die-cut the label background using a Spellbinders die and inked it with Vintage Photo distress ink. 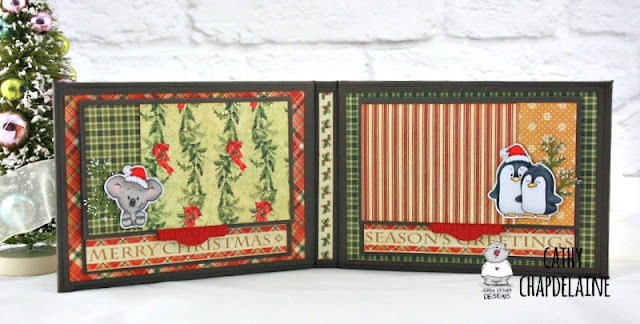 The holly is die-cut from velvet paper and also a Spellbinders die. 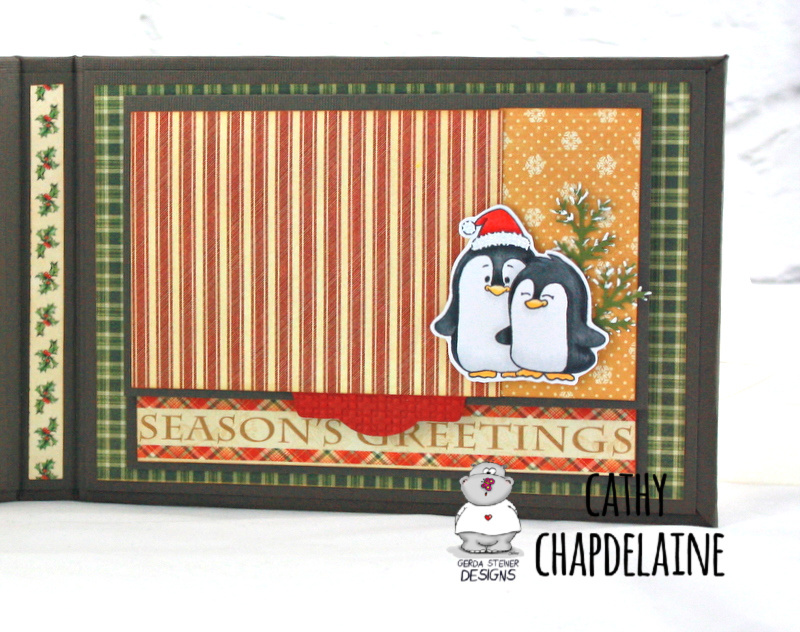 I heat embossed the sentiment from this stamp set using Recollections "champagne" embossing powder. There's a flap on the inside of each cover with a magnet closure providing space for 3 photos on each side and I had a lot of fun coloring up a bunch of adorable animals wearing Santa hats! 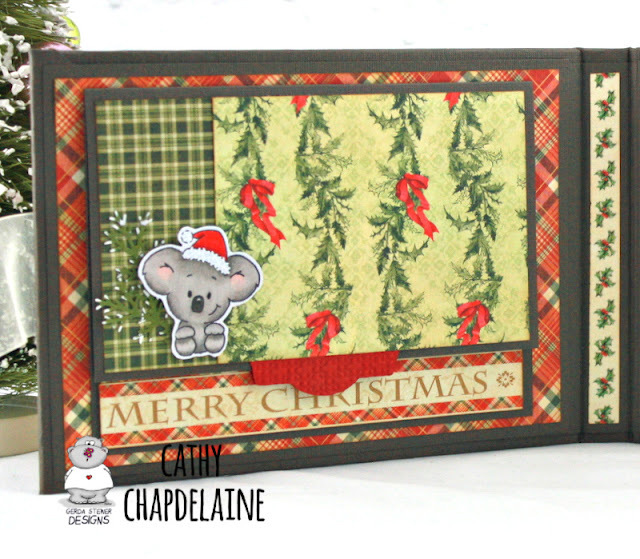 A closer look at the inside of the front cover featuring a little koala from the "You're Koalafied" stamp set. I've stamped a Santa hat on all of the animals in this album using a stamp from an MFT stamp set, so be aware of that if you want to make them Christmas themed animals like this. The inside of the back cover features a couple of cute penguins from the "Valentine Penguins" stamp set. I've used a Martha Stewart branch punch for the branches behind all of the animals and painted the tips of the branches with white acrylic paint. Inside the flap on the left side is a sweet owl from the "Owl Rather Be With You" stamp set. 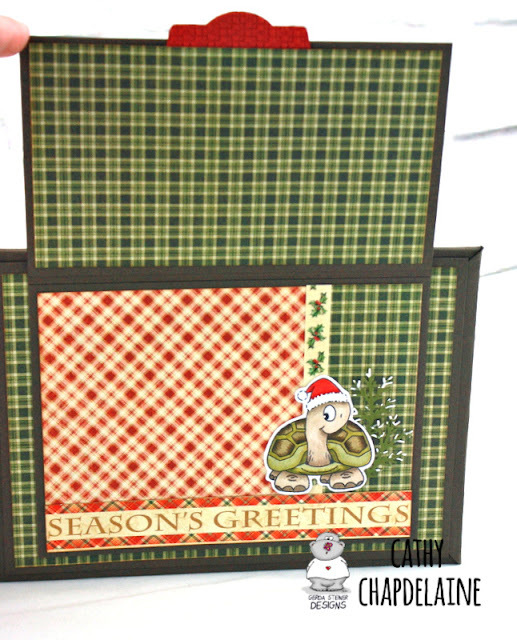 Inside the flap on the right is a happy turtle from the "Turtley Great" stamp set. Hope you enjoyed my mini-folio today. It was so much fun to make!